We all have a bucket list of things we want to do during our lifetime, and skydiving has always been on mine. I like a good adrenaline rush, but Alan is the adrenaline junkie in our family. Since being with him, I’ve been on more adrenaline rushes than I can count, from zip-lining through the rainforests of Costa Rica to shark feeding underneath the ocean in Bora Bora to white water rafting down the Toro River. Yes, I’ve married a daredevil, and he’s constantly trying to persuade me to try the next exciting adventure. For the longest time, he’s wanted me to skydive with him, and I’ve always told him that if I were to do it, it would have to be somewhere beautiful. New Zealand, I thought, until I saw a photo that a friend of mine posted on Facebook. It was a photo of her skydiving in the North Shore of Oahu, with the most magnificent view beneath her, and a picturesque rainbow above her. I decided then, that I would be ready and willing to try this seemingly dangerous adventure on our Hawaii trip in March. Today, on March 25, 2012, I finally and officially crossed this item off my bucket list! It was a surreal experience from beginning to end, and one that I will never forget in my lifetime. Along with my cousin Jacqueline and her boyfriend Peter, the four of us (and Bridgette) drove 1 hour to North Shore early this morning, where we jumped off a plane over 10,000 ft high. No, Bridgette did not jump, despite Alan’s claim that his research showed there was no legal age restriction on skydivers. Upon arrival to Skydive Hawaii, we were each asked to sign a 4 page waiver, acknowledging the dangers and risks of skydiving. At the bottom of each page was, in big bold letters, a reminder that we could be seriously injured or killed by skydiving. How reassuring for those of us who were already having anxiety attacks at the thought of jumping off a plane. Because we had to take turns watching Bridgette, the four of us couldn’t get on the same plane together. We split up into pairs, and I ended up pairing with Jacqueline because both of us only wanted to jump at 10,000 feet, whereas Alan and Peter wanted to go 15,000 feet. My tandem instructor, named Kyle, was so amazing. He had a great sense of humor that calmed my nerves, and it felt reassuring to know that he’s been skydiving since 1996. On average, he jumps about 6 times a day, sometimes up to 12! Here's the plane that we jumped out of! This arial view of Oahu was amazing! Okay, I was obviously scared as we jumped. The moment we jumped out, I felt like the earth beneath us was just spinning in circles. 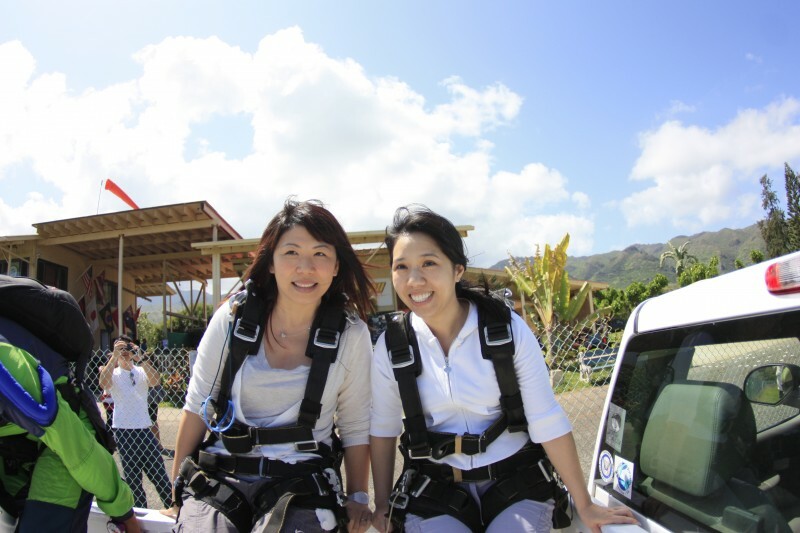 We were free falling at 120mph, but surprisingly, you don’t have the same stomach-knotting, heart-dropping adrenaline rush as you would on a roller coaster ride. You simply feel like you’re flying, soaring through the clouds! It was an indescribable feeling of thrill. Kyle was posing for the camera the entire time; it was hilarious to see him in the photos! The main feelings of discomfort were from the chill, the wind, and the pressure of the altitude. I felt like every part of my face was being ripped off, and that my ears were going to pop open any second. The free fall portion of our jump lasted about 30 seconds as we whirled down at 120mph. When Kyle released our parachute, we were jerked upright immediately, and from that point forward, it was a very pleasurable experience as we floated atop beautiful North Shore. He let me take control of our parachute for awhile, teaching me how to turn and spin. It was truly an amazing experience up there! Next PostHawaii Trip | The Aulani Experience Part I. How exciting, Jubilee. So glad that Alan talked you into the jump. FANTASTIC PHOTOS!!! Skydiving is on my bucket list as well! 🙂 We decided to wait until we go back to Kauai later this year! Thanks for sharing!